On June 4 1913, suffragette Emily Wilding Davison made her way in to the history books of political protest when she fell under the hooves of George V’s horse at the Epsom Derby. She sustained fatal injuries and she died 4 days later. Davison had studied at Oxford University before becoming a teacher. She joined Emmeline Pankhurst’s Women’s Social and Political Union (WSPU) in 1906. The WSPU’s mission was to pull together people who felt strongly that radical and confrontational methods were required in order to achieve women’s suffrage. Their main aim was winning the vote for women. Davison left her teaching post in 1908 to devote all her time to the cause. In her 41 years, Davison had been force fed on 49 occasions and had been jailed 9 times, including one prison term for a violent attack on a man she mistook for the Chancellor of the Exchequer. As such she gained a reputation for being a violent militant activist and was well known to the police. Despite camera technology being in its infancy, three newsreel cameras captured the tragedy from different angles. At the time, cameras were bulky and there was no such thing as a tracking camera, instead they were static and were limited in what they could cover. 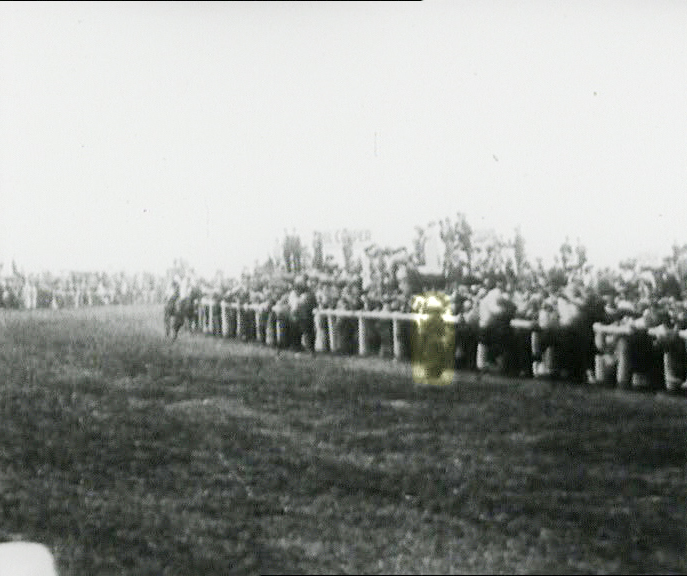 However, the Pathe News camera was placed to the right of Tattenham Corner and was waiting to capture the horses as they raced around the corner. It happens in a flash but Davison can just be made out running on to the track. Some horses sweep by her but the king’s horse Anmer, who is third last, ploughs into Davison. The horse somersaults, catapulting its jockey Herbert Jones in to the air. Spectators flock on to the track to attend the injured. Jones suffered mild concussion and later he went on to say that he was “haunted by that poor woman’s face”. Some 30 years later, Jones was discovered to have committed suicide after his son found him in a gas-filled kitchen. There has been much speculation about Davison’s intentions on that fateful day and many are divided as to her true motivation. 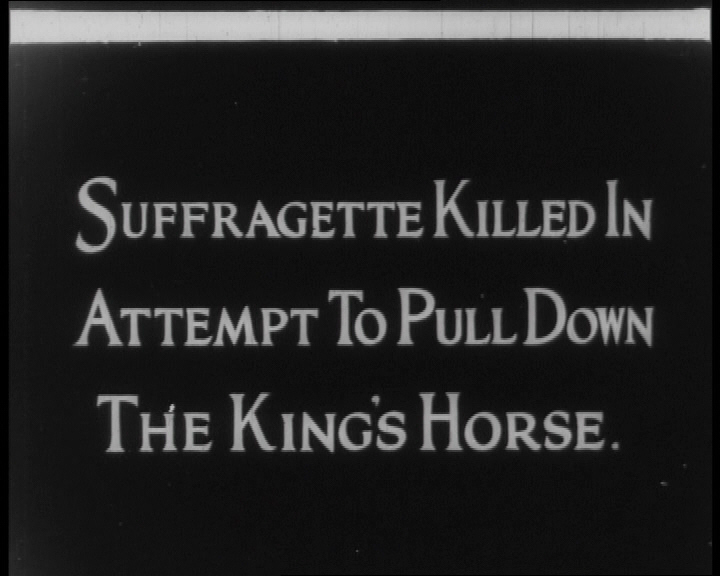 The 1913 title card from the Pathe Newsreel reads “Suffragette Killed in Attempt to Pull Down the King’s Horse”. This was the general consensus at the time – that it was a deliberate act. Sylvia and Emmeline Pankhurst had no doubt that Davison deliberately killed herself out of downright passion for her cause whilst others saw her actions as reckless and anarchic. However, evidence suggests that Davison was not at the Derby to commit suicide but instead she was there to attach a flag to the horse’s bridle in order to bring attention to women’s suffrage. In fact police reports suggested that two flags were found on her body. Other evidence to support that martyrdom was not her intention includes her return train ticket back to London plus a ticket she had for a summer festival later on that day. Also a postcard she had written to her sister suggested that they were due to holiday together in the near future. Evidence which seems to clearly indicate that she intended to leave Epsom Downs that day. Historians have also suggested that Davison and other suffragettes were seen practising grabbing horses in a park near Davison’s mother’s house and they drew straws to decide who was going to be the one to go to Epsom. Whether she deliberately sought after death or not, suffragettes embraced Davison as a martyr to her cause and used the funeral to highlight the WSPU movement. On 14 June 1913, Davison’s coffin was taken in procession through the streets of London to St George’s Church in Bloomsbury. 6000 women turned out for the service. At the inquest in to her death, police reached the verdict of ‘misadventure’. It made no difference, and he seems not to be alone. In local council and European Parliament elections only a third of the electorate bothers to vote. Just as bad, 20% of citizens entitled to vote in the UK – almost 9 million people – don’t even register to do so.